The Mets cut their magic number to eight with a 5-1 win over a team that had Met castoff Chris Young (.122 batting avg. in August) batting cleanup. Steven Matz, making his fifth career start, outpitched Yankees ace Masahiro Tanaka. No wonder Squawker Lisa called her blog entry "We'll always have Luis Castillo." These days, what you have is Stephen Drew. Lisa and I agree on one thing - it's better for the blog when both teams do well. But now it's the Yankees who are failing to hold up their end of the bargain. 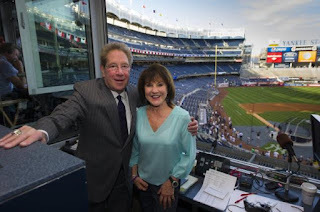 Lisa writes: "The Subway Squawkers talking about an October Subway Series will get much more screen time than if only the Yankees make the postseason." Face it, Lisa: The only way there will be an October Subway Series is if the MTA manages to build a subway line to Toronto in the next month, and considering that it took 25 years for one new station to open (the Hudson Yards 7 stop), I wouldn't hold my breath. The Yankees remain likely to make the wild card game, where they should have a good shot with Tanaka on the mound. But unlike Squawker Lisa, these Yankees are not ready for their closeup.